Too Wet to Plow and other artwork by artist G. Harvey can be viewed in our artist slideshow. Too Wet to Plow by artist G. Harvey and other Gerald Harvey art, art work, artwork, canvases, giclees, images, limited editions, open editions, paintings, paper, pictures, posters, and prints can all be found at Christ-Centered Art. 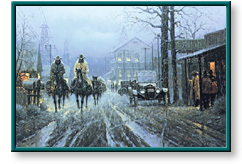 Too Wet to Plow depicts a pair of cowboys from days gone by returning home on a rainy day. Soggy weather and muddy roads prevented even the hardest-working cowboys from making much progress in the fields. This unframed limited edition paper print comes mint in its original folio, includes a genuine certificate of authenticity from Somerset House Publishing, and is individually numbered and hand signed by the artist G. Harvey. It is part of the 12 print Connally Collection which was specially selected by former Texas Governor John Connally. Price includes all 12 matching number (#977) prints in the collection. This unframed limited edition paper print comes mint in its original folio, includes a genuine certificate of authenticity from Somerset House Publishing, and is individually numbered and hand signed by the artist G. Harvey. It is part of the 12 print Connally Collection which was specially selected by former Texas Governor John Connally. Price includes all 12 matching number prints in the collection.